MOSCOW, August 10. /TASS/. Moscow calls for a thorough and comprehensive investigation into the recent incidents in Yemen, which killed dozens of civilians on August 2 and 9, the Russian Foreign Ministry said in a statement on Friday. On August 9, an airstrike hit a bus in Yemen’s northwestern province of Saada, killing 50, mostly children and teenagers. On August 2, a similar attack on a fish market and a hospital in the city of Hodeida resulted in dozens of fatalities. "Moscow is deeply concerned that the ongoing armed conflict in Yemen continues to claim civilian lives," the statement reads. 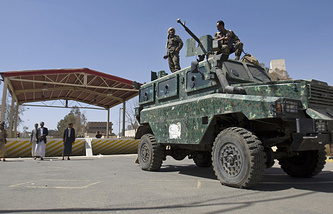 "Leaders of the Ansar Allah Houthi movement, which controls the areas where the incidents took place, put the blame on the Saudi-led coalition," the Russian Foreign Ministry said, adding that "however, Riyadh has strongly rejected its involvement." "In connection with these tragic incidents, we would like to emphasize the need to carry out a thorough and comprehensive investigation," the statement says. "Those responsible for the death of innocent people must be brought to justice," the ministry stressed. At the same time, Moscow has called on the parties to the Yemen conflict to strictly abide by international humanitarian law and "take urgent measures that would make it possible to prevent such tragedies in the future." "We still believe that resolving all the existing disagreements at the negotiating table is the only reasonable way to end the bloodshed and the Yemeni people’s suffering, provided that the interests of all the political forces are taken into consideration," the Russian Foreign Ministry concluded. The war between Yemen’s government, recognized by the global community, and the Houthi rebels has been raging since August 2014. The conflict entered an active phase when a Saudi-led coalition invaded the country at the request of President Abdrabbuh Mansour Hadi. Saudi Arabia, supported by the air forces of Bahrain, Qatar, Kuwait and the United Arab Emirates, is involved in a military operation against the rebels. Egypt, Jordan, Morocco and Sudan are also part of the coalition. According to the Yemeni Center for Human Rights and Development, in the first 800 days of bombings, more than 12,500 civilians were killed. The United Nations says that three-thirds of the Yemeni population - 22.2 mln people - are in need of aid, while the number of internally displaced persons has exceeded two mln.